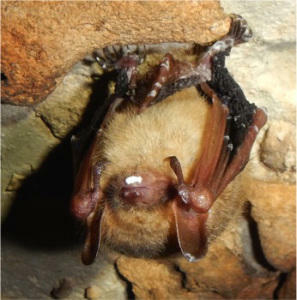 This Tri-colored bat in Crumps Cave shows clear signs of infection by the fungus associated with White Nose Syndrome. Dr. Chris Groves talks with WKU Public Radio's Kevin Willis about the latest discovery of bats with White Nose Syndrome. 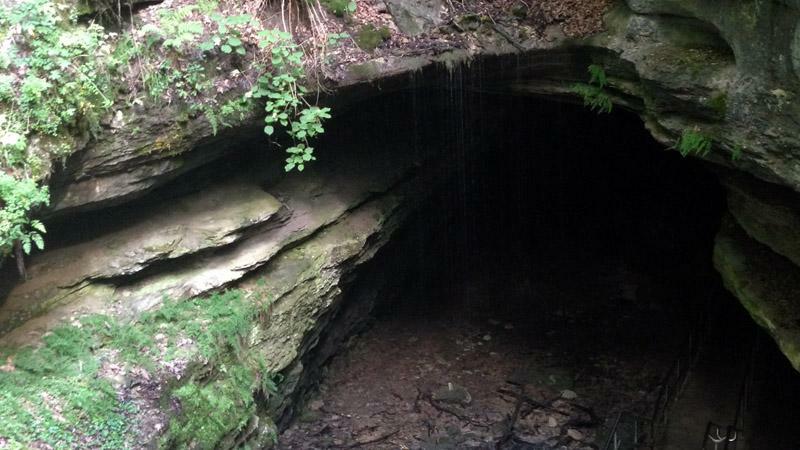 Researchers say the discovery of a deadly fungal disease in a Warren County cave spells more trouble for the region’s bat populations. A team of National Park Service scientists found evidence of White Nose Syndrome in Crumps Cave in northern Warren County, near the town of Smiths Grove. WKU owns several acres of land around the cave and operates a research and education preserve there. White Nose Syndrome, for which there is no known cure, is blamed for the deaths of millions of bats in North America since its discovery in 2006. The team of NPS researchers observed 53 Tri-colored bats inside Crumps Cave on Feb. 10, with a dozen of them displaying signs of White Nose Syndrome. The disease causes bats to prematurely awaken from their hibernation and leave the cave, which exposes them to freezing conditions. Affected bats use up vital energy and nutrients that are necessary for their survival. The syndrome was discovered in 2013 in Mammoth Cave National Park, and has led to an 80 percent decline in some bat species found there. 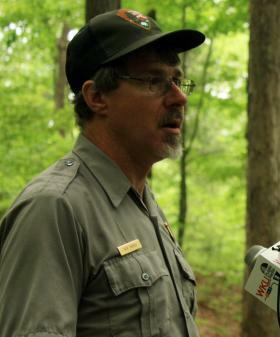 Watch a video about efforts to combat White Nose Syndrome in Mammoth Cave National Park. “There are bats that, prior to the discovery of White Nose, were doing just fine, and had very healthy populations, and now are potentially in danger of extinction,” said Dr. Chris Groves, Distinguished Professor of Hydrogeology at WKU. Groves serves on the management team at WKU Crumps Cave Research and Education Preserve, and has requested help from the NPS in creating an inventory of bats found in the cave and evaluation of conditions for White Nose Syndrome. If the disease continues to spread and kill high numbers of bats, the region’s ecosystem could be damaged. Bats are prolific eaters of pests, such as mosquitos. The agriculture industry could also be impacted. While research continues into finding a cure for White Nose, biologists have set up programs designed to reduce the chance that humans who enter caves leave with the fungus on them. White Nose doesn’t harm humans, but it’s possible that a person could unwittingly come into contact with the fungus and spread it to another area upon exiting the cave. A researcher at Mammoth Cave National Park is fearful that a fungal disease is set to kill large numbers of bats in the region. White Nose Syndrome was first discovered at the park in south-central Kentucky last year, and has impacted at least six of the eight bat species found inside the cave. Rick Toomey, director of the Mammoth Cave International Center for Science and Learning, says researchers at the park are expecting a spike in White Nose cases. Toomey says an estimated 6.5 million bats in North America have died due to White Nose Syndrome, although he believes the actual number could be much higher. Great Smokey Mountains National Park in Tennessee has recently seen a surge in bat deaths due to White Nose Syndrome—deaths Toomey says haven’t shown up yet in official estimates. After a 10 minute climb up a gentle incline just off the main trail at Mammoth Cave National Park, Rick Toomey stands on a wooden platform overlooking Dixon Cave. “It’s one of our most important hibernation sites,” said Toomey, the park’s research coordinator. He says during the winter thousands of bats, including several different species hibernate here. But those numbers might be on the verge of a drastic change. The problem: White Nose Syndrome. It started in the northeast in 2006. It was first noticed at Mammoth Cave in 2013 and has since spread to the caves that welcomed nearly half-a million visitors last year. Toomey says the fungus that gives White Nose Syndrome its name is just one of the symptoms of the devastating disease.